We're off to see the Wizard, the wonderful Wizard of Oz! Are you ready to go visit the Emerald City of Seattle, WA? Disney has rolled out a New Year's Road to Emerald City sweepstakes. Potential Prizes: Grand Prize of a 4 day/3 night trip to Seattle, WA for two or Instant Prizes. Make sure you send those tweets until the end of day January 31, 2013 for your chance to win! 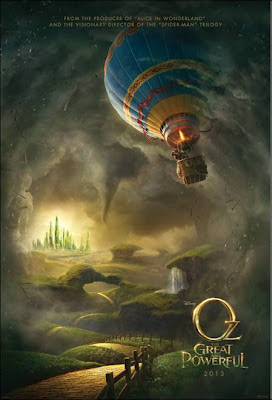 For instant win prizes and more info, visit the official Oz The Great and Powerful Facebook page. There you'll see the tweets that are paving the way to the Emerald City. Click on select bricks to instantly win prizes which include a grand array of $100 gift cards to HSN, $50 Visa cards, $10 Starbucks gift cards, copies of the L. Frank Baum Book, “The Wonderful Wizard of Oz,” signed movie posters, and a variety of “Oz The Great and Powerful” products. Oz, The Great and Powerful opens in theaters on March 8, 2013! Open to US, Canada (except Quebec), and DC residents, 13+ years. Thanks for sharing Cinny! the Wizard of Oz is one of my favourite stories, ever. I want to go to there! :) I'm so excited for this movie! Love the Wizard of Oz. Thanks for sharing. This looks like such a great movie. Thank for sharing.